Amidst the white sand and turquoise blue surf moving in and out with each tide along the Tropic of Cancer beach on Little Exuma, strange and unusual things, mostly made of plastic, come ashore in the Bahamas. Sailboat bumpers and mossy green fishing floats, some with the shredded rope attached, find their way in, escaping their nautical past. Mountain residents turned vacation beachcombers, we're searching for shells or bits of sea glass. Yet we find a baby's shoe, shoestring still tied; a single rubber sandal, a Converse tennis shoe and a child's Mickey Mouse sandal. Never two of the same shoe, just one, its mate no doubt washed up on another island. We find a lot of plastic containers in all shapes and sizes. White aspirin and Advil bottles, black and green boat oil motor bottles, water and juice bottles. Plastic bottles clearly float very well, sailing along effortlessly thousands of miles. After a few days of December winds, the evening tide delivers small treasure troves of shells for our morning hike. I find a large irridescent pen shell, which, of course, I thought was a piece of plastic at first. The colorful Bleeding Tooth Nerites are exciting to find. Polly's calls them Baby's Bleeding Tooth, and remembers when her aunt would bring them back to Pittsburgh after trips to Florida. We find several shiny yellow shells of bi-valves, but just pieces of the popular conch, the meaty mollusc that divers search to meet both Bahamiam's and tourist's appetite for deep-fried conch fritters or fresh conch salads. You tug aside globs of dried seaweed, sometimes finding tiny gorgeous shells buried beneath, mingled with sponges and broken sand dollars. And you find more pieces of plastic ... pink, white, blue, red and yellow. You wish they were smoothed out sea glass but really they're just parts of everyday life that never made it to the landfill. In a way these beautiful beaches are a junkman's dream. Rubber parts, broken wooden boxes and undistinguishable warped and water-logged objects come ashore. On our first walk down the beach, I wish I had brought a trash bag. But then you realize, inspecting where the tide has pushed the sand up into tiny carved-out cliffs, there's more things than one person could ever carry out. It's almost Christmas, and we find pastic toys. While fishing along a small flats, Polly brings me a blue plastic crab, suggesting I try it as a lure. Instead of bonefish, I start thinking about the multitude of tiny plastic toys manufactured in China to meet the world's never-ending demand. How many toys do you think are made every day? Then, somehow, the plastic animals and doll heads escape into the oceans, some finally finding their way into a sandy cay. You could build quite a bit from all of the things washed up on the beach. Slowly but surely, you'd find just about everything you'd need for a tropical shelter. You'd catch rainfall in the plastic buckets and fish with your choice of nets and line. You could build your own small boat, with no shortage of buoys, robes and metal parts for an anchor. You'd build a small crusty fishing shack, nailing odd pieces of driftwood and the brighter pastic odds and ends to the walls for decoration. As tides deliver more building materials, you'd add another room or two. I'm not trying to make a big environmental statement or deny that the Bahamas has some of the nicest beaches I've seen. There's not a beach in the world I've visited, whether it's Mexico, the U.S., or the Caribbean that do not collect the washed-up pieces, parts and stuff of our modern world. Look around, how many plastic things would float out of your home in a flood? The tiny cartoon heads of my Pez collection stare at me as I write this. Several of them, I'm sure, would like nothing better than a long ocean cruise to the Bahamas. When I read this week that Spirit Airlines is planning a carry-on bag fee, I just rolled my eyes and thought, well here we go again. The great airline baggage fee debate gets crazier every day. I recently flew United Airlines back to Louisville, Ky., where my parents live, so I could drive up for the NCAA Final Four championship games in Indianapolis. I knew it had been a year or so since my friend had flown, so I called him up to remind him that if he was taking a regular bag in addition to his golf clubs, he was facing about $55 in additional baggage fees each way. At first he didn't believe me, but once he checked, he quickly decided to just take a carry-on, and pay the $25 for the golf clubs since we were also planning on a few games of golf in between watching the night games. But as we all know now, the jamming and squeezing of everyone's carry-on bags is just another inconvenience we all face as we board and exit the planes. And for the direct flight back to Kentucky, we were flying a much smaller regional jet, which means that most people with carry-on had to get a small green tag for their bags, which were then stowed in some secret compartment separate from other baggage. That meant another wait for everyone to pick up their carry-on bags after arrival. When we left Louisville, United also did not assign seats until shortly before departure. I know there must be some reason for this, but if the poor airline clerk was left telling nearly every arriving passenger they would need to wait a bit for their seat assignment. I sat there and listened as she said the same thing at least 30 different times. Is this really the most productive way of using employee time. As passengers these days, we're all more anxious and a bit nervous. We fret about whether our shampoo bottle will pass muster; we worry that we'll be pulled over for a body search. Forget about worrying about a terrorist lighting up his shoes, you have to worry that your socks don't stink too much as you pull your shoes off to go through security. All I'm asking is that the airline companies find some ways to make traveling enjoyable again. I think most the airline employees are working hard to be friendly, but all of the penny-pinching is getting to them, too. I know that we'll soon have to pay again when wireless Internet comes to the airlines. But wouldn't it be nice if that was a freebie? How about giving everybody a bag of pretzels or chips again? Just a few friendly gestures would really be nice. Too many of us today really think hard about traveling if it means flying rather than driving. A nice local trip that avoids the airport starts to make sense when you factor in all the hassle factors of flying. I have another reservation on Frontier to fly back to Kentucky for some Derby parties, some golf and some days betting a little at Churchill Downs. I'll be paying extra to take along my clubs, as well as a bag of clothes. And I'll take my own bag of peanuts. New developments are being built in La Paz on the Baja, but will the economy and tourism downturn slow sales? That's the big question. Penny-pinching American tourists, a devalued peso and endless stories of drug cartel shootouts are hammering Mexico’s tourism economy at a time when new projects are searching for time-share and vacation home buyers. Old tourist haunts are missing their regular customers. He laments that business was down this winter and spring, although a top rating in the new Moon tourism book helped bring in new customers. But just a block away, a recently redeveloped five-star historic hotel, La Mision, looks nearly empty, with no one sipping margaritas around its enormous pool. April, I’ve decided from years of Baja trips, is great weather to escape south for a fishing trip and relaxing getaway. I dodge the crowds (and prices) at Cabo San Lucas in favor of smaller East Cape hotels and La Paz up the coast. Every year, I stare in amazement at new developments spreading out from Cabo. In recent years, several projects broke ground around La Paz, a city visited more by Mexicans than gringos for its uncrowded beaches, malecón restaurants and awesome sunsets. A new marina is open, and three new golf courses are going up, including the Costa Baja Resort, Gary Player’s first course design in Mexico. The only question right now is who’s going to buy? Sales offices were usually empty as I strolled by them in downtown La Paz. One Colorado couple I met had been in La Paz for two months. “Sometimes we’re the only people in the restaurants when we go out,” they said. According to the Gringo Gazette, a Cabo-based newspaper, “off the record” discussions with local Realtors say real estate sales have ground to a halt, maybe down 75 percent from a year ago. A big part of the disconnect is the slumping peso, which tumbled about 40 percent against the dollar in the past few months, as well as the closed credit windows in the U.S. When sales prices of vacation properties are translated into pesos, sellers must pay the capital gains tax at a much higher peso price. A million-dollar sale a year ago was 10.6 million pesos, but today, it’s about 15 million pesos, with the higher tax rate eating into profits, if there are any. According to one Realtor, this is kicking an already slumping real estate market in the teeth. Despite the gloomy news, developers are betting big on the Baja’s “desirability” factor. Entire hillsides outside La Paz are marked with white paint, showing lots for new homes. Glossy magazines still promote homes priced anywhere from $7 million in Cabo to $300,000 and less in Los Barriles, Todos Santos and La Paz. Near our fishing spot around Isla Cerralvo, prolific for dorado, sea bass and larger sailfish and marlin in the summer, there’s now a speed bump on the dirt road and signs promoting a project with the theme “The dream is worth the drive.” From here, Mexican captains launch their pangas, sturdy but basic fishing boats, from an area called Muerto Bay in the Sea of Cortez. But “muerto” or “death” in translation didn’t seem to fit with the developer’s desired image. So now the area has been renamed “Bay of Dreams,” or Bahia de los Sueños. It’s a hot, dusty region where agriculture, a salt mine and fishing were the only businesses. Today, workers scoot around on golf carts, and water pipes are being laid for the GranSueño hotel, golf course and private “casitas”. A new paved road now makes the area just an hour drive through the desert and mountains from the East Cape, and an airstrip is ready for private aircraft. One thing for certain, Mexican resorts have learned the fine art of enticing Web sites, and on the Baja, the coastal mountain and deep blue ocean views are as scenic as anywhere. For bargain hunters like myself, more pesos to the dollar make the Baja even more affordable, and our Frontier flight was packed with Coloradans heading for the sun and resorts. Mexico is making a big investment on repaving roads and rebuilding bridges, and our four-hour drive up to Ciudad Constitución to Loreto on Highway 1 was completely safe and pleasant, passing through just one checkpoint where the military police looked in our cooler and waved us through. Walking around Loreto, police would stop traffic, smiling and waving me across. Somebody down here put the word out – be nice to visitors. There is word that increased checkpoints, and possibly fingerprinting and digital photos, are being put in for a “Southern Baja, Safe State,” keeping out any bad guys fleeing from the north. Although an inconvenience for visitors traveling by car or camper, it’s probably better to be safe than sorry. While doing a little exploring in the desert on a recent trip to Loreto, Mexico in the Baja, we came across a small arroyo, lush with ferns, palms and other plants thriving from a small spring-fed creek. It was the green foilage in the middle of the arid desert that attracted us, but we soon discovered this is also an area known as Cuevas Pintas, an archeological zone with some interesting ancient paintings on rock walls in a sheltered area near the stream. 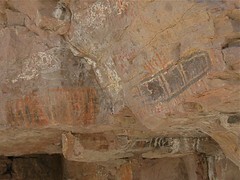 Several paintings are scattered throughout the La Giganta Mountain Range, and these are the closest to Loreto, just about 15km to the west on the road that leads to Las Parras from Highway 1. The road is paved for part of the way now, and crews, as of April 2009, were busy working to complete the paving. We turned around when the paving ran out because of our small rental car, but the gravel road is passable. You'll now see a sign posted on the side of the road for Cuevas Pintas, making it pretty easy to find. A small trail leads up the canyon and along several beautiful pools of water. There's only a small fence and information sign protecting these paintings, but the area was surprisingly clean given how accessible it is. It's easy to see the appeal of the area to the ancient peoples of the Baja, and it's believed most of the paintings were probably done by shamen, possibly in some type of ceremony. I haven't found a lot of information on this particular site, but did find a good site on petroglyphs and pictographs in the northern California Baja. Photographing these paintings just makes me want to find some more next trip down to the Baja. While much of the world seems stuck in a delay mode waiting out the global economic crisis, Panama on March 3 will announce the winning bid for a new $5.25 billion expansion of the Panama Canal. Building the third lane of the canal, with two new locks at both ends, will nearly double the canal’s capacity and allow it to handle the larger super-tanker vessels from all nations. Completion is set for 2015. The waterway between the Atlantic and Pacific oceans, which employs some 9,000 workers, is considered one of the greatest engineering feats in history, with builders digging through nine miles of mountains at the Continental Divide. Naturally, the popular Miraflores Locks and visitor center was my first stop as I visited the country for 12 days this month. Arriving in Panama City, one gasps at the number of high-rise projects. I counted at least a dozen cranes topping both office and condo projects. Already mired in snarled traffic and density problems, you have to ask if this is Panama in a recession, how much more will it explode when the economy improves? Two years ago, Panama passed its Law 41, offering incentives to multinational companies to develop regional headquarters there. As a result, commercial real estate climbed 25 percent last year, and right behind it has come residential sales. This was my first trip to Central America, and I’d heard the days of real estate deals in places like Costa Rica were already over. Get to Panama, friends said, before the next “gringo” invasion storms in. Talking to travelers from Nova Scotia, Iceland and, of course, California, as well as the energetic British couple who camped in their Ford van along the entire Interamerican Highway from Alaska to Panama, it became clear that “Se Vende,” for sale, is now a national theme. Huge billboards tout “Lo Ultimo en Lotes!” and block the views of Panama’s lush green mountainsides. Even larger signs and flags for this year’s presidential election interrupt beachside condo ads. With a rental car, we traveled west from Panama City toward David, a winter escape to the white sand Pacific beaches of Santa Clara and black sand at Santa Catalina, a tiny town adored by surfers and backpackers arriving on the daily buses. Just outside of town, however, a new small airport is being built. Mike and Michele Shogren, an enterprising American couple from Alaska with comfortable cabanas at La Buena Vida, just shake their heads and wonder how Santa Catalina will handle more tourists. That day high winds had blown off part of their kitchen’s roof and knocked out power … again, closing the only three or so restaurants in town. We grabbed a streetside dinner of fried chicken and plantains from some of the locals who we had hired to take us out fishing earlier that morning. Although we skipped the Caribbean side and the popular Bocas del Tora area on this trip, no place probably epitomizes the land rush more than the mountain town of Boquete, famous for its delicious coffee and oranges but now home to a real-estate rush of American and European retirees attracted by its cooler mountain weather. Wander into the Amigos bar off the town’s plaza, and conversations of constructions fees, land prices and broker commissions fill the air. Colorado in the ‘70s? One project, Valle Escondido, helped kick off the boom after snapping up 125 acres of coffee-growing land. Now, with coffee prices in a slump, the Panama Post reports the country’s coffee acreage has dropped nearly 60 percent, with producers selling out for millions. Some resorts around the country, primarily operations offering birding, rafting or hikes in the tropical forests, do seem to be getting the word out on the value of eco-tourism, and Panama itself has watched how nature friendly tourism boosted Costa Rica. Jim Omer, a Coloradan with a home in Ridgway, runs Boquete Outdoor Adventures, specializing in rafting and whitewater trips but also building more saltwater fishing trips into the Golfo de Chiriqui below David. With this unusual “dry season” storm stuck on nearby Volcán Barú, Panama’s highest peak at 3,475 meters, Jim was trying to keep up with bookings without cell phone or Internet access for days. Just part of business in Panama, he said, as he set us up on a day trip to a tiny Gilligan’s Island for snorkeling, beach lunch and hammock napping. Crazy taxi driving in the bigger cities aside, I loved Panama and recommend seeing it now. I’d like to get over to the Caribbean, maybe even to the remote San Blas islands dotting the Kuna Yuna region. Get yourself a Moon or Lonely Planet handbook, and map out your own Panama adventure. It’s not much more to fly there than Mexico, and once you’re out of Panama City, prices for smaller hotels and delicious seafood dinners are still a bargain. The biggest worry for most of us who travel by air is usually whether or not our luggage will be lost. But if you’ve ever experienced a medical emergency during a flight, as my companion did on a recent Frontier flight back to Denver from Seattle, a lost bag suddenly becomes a trite issue. When a life possibly hangs in the balance of whether or not a trained doctor is on board, as well as the emergency training of the airline flight attendants and quality of in-flight medical kits, you realize a jetliner cruising at 30,000 feet really isn’t the best place to get sick. First, I truly commend the outstanding customer service of Frontier employees, from the reservations clerk who dropped a $100 change fee on our tickets due to our medical need to get back to local doctors, to the ticket counter clerk who moved us to the front row of seats since Allison already was weakened by what we later learned was a worsening case of pneumonia. A word to the wise. Your doctor should warn you, although they did not in our case, that if you are not feeling well in the first place, cancel your travel plans. If you already have a breathing problem even from a severe cold, airline travel worsens the condition because cabins are pressurized at 8,000 feet and have less oxygen. So now we know. Once Allison joined me in Seattle, it didn’t take a medical degree for me to cancel our vacation plan to join friends on a sailing trip in the San Juan Islands. I could see Allison was fighting more than a nasty cold. She did seem able to travel, and we quickly rebooked a flight home. About half way through the flight, however, some coughing took a change for the worse, and she began gasping to catch her breath. That’s when those front seats became important as I told the flight attendant Allison needed oxygen immediately. I’m afraid other passengers did not get their second coffee or drinks on the flight as two flight attendants and a member of the flight crew transformed into an alert medical team, asking if a doctor was on board and making the call to a doctor on the ground for emergency advice. Our sincere thanks go out to two extremely caring medical students from Vanderbilt University, who, once Allison was receiving oxygen, checked her vital signs, kept her (and me) calm and helped make the critical decision that her heart seemed fine and the flight could continue to Denver without having to divert to Salt Lake City. When we landed, other passengers remained seated and calm as fire department paramedics boarded to help Allison off the plane and into the hands of a medical team waiting at the airport. After another check-over and good advice from paramedics, we knew the wisest move was the ambulance ride to the emergency room at the Anchutz Medical Pavilion of the University of Colorado Hospital in Aurora. The incredible attention and medical treatment Allison received there for a very serious bout of pneumonia could be another column. Both of us are still talking about the unsurpassed quality of care at UCH. While the Frontier staff performed at their best, the experience made me question the tools airlines have on board for emergencies in these times of cost-saving cutbacks. When Allison was chilled during her breathing attack, it was another passenger’s coat, not an airline blanket, that kept her warm. Remember, most pillows and blankets have been removed from overhead bins. The young doctors were frustrated by a stethoscope from the medical kit that was inadequate for them to listen to Allison’s condition. If she had been having a heart problem, this could have been serious. Other doctors and even the World Medical Association have urged airlines to upgrade their medical emergency protocols. By law, airlines now must carry automatic external defibrillators, oxygen and medical kits. And some airlines carry extra, non-mandated medications. In fact, Frontier did have an Albuterol inhaler, and that, with a glass of orange juice, eased Allison’s breathing. Really? An impossible task? Or just a desire to avoid some bad PR about the number of medical problems happening on flights? 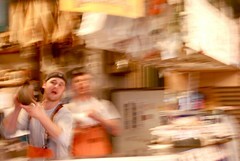 If you've been to Seattle's Pike Place Market, you've seen the flying fish as customers pack up some fresh salmon or crab for their plane flight home. I never miss this incredible inner-city market whenever I visit, packed with fresh fruit, flowers and arts and crafts vendors. What's really fun is that after three or four silver salmon fly back and forth between the ice counters out front and the guys who wrap them up, a fish usually flies right at a customer's face, but turns out, it's only a stuffed pillow! Good for a screaming tourist or two. I was in Seattle to visit some friends, and was suppose to be sailing for a week in the San Juan Islands. Unfortunately, we returned home early as my girlfriend fell ill with a serious bout of pneumonia and was admitted to University of Colorado Hospital. We missed our sailing trip, but we also discovered the excellent and caring medical teams at UC Hospital. And now Polly's home recovering. I'll return another day to get that sailing trip in, we love this scenic area of the Northwest. After years of visiting La Paz, the 471-year-old capital city of southern Baja, it's clear that the Mexico city is finally attracting the attention of numerous developers. The fishing remains some of the best in the world, the weather in April was nearly perfect -- 90s in the day, cooler evenings and although the flight down is packed with American tourists, almost all are heading to the resorts of Cabo San Lucas. Few still take the drive up the East Cape and over the mountains to La Paz, a city of about 250,000 and a center of commerce for the Baja. While a few condo projects such as La Concha Pearl have been marketed for several years, La Paz has escaped the onslaught of large hotel, condo and golf course projects. As a result, the city has been much more affordable, attracting more Mexican visitors than gringos. But big changes are in the wind. A new project, Playa del La Paz, is planned as a high-end luxury development, with 60 condos being offered, starting at about $700,000. Even more amazing, we discovered numerous "private property" signs poking out of the desert on the drive out to Tecolote Beach, where you can depart for panga rides or kayak trips out to the environmental sensitive Espiritu Santo Island. A new project, Maravia Country Club Estates, including an 18-hole golf course, is being advertised there. Espiritu Santo is a biological wonderland, where new species are still being discovered. Fortunately, after years of debate, the island has been protected by the Mexican government. But the prospect of new development and a golf course just across the narrow strait between the island and the peninsula is worrisome. The 23,383-acre island in the Sea of Cortez is one of the most biologically diverse marine areas in the world and holds both tropical forests and coral reefs, the two richest ecosystems and the two most threatened by climate change, according to IPS News. The waters around the island also are home to resident colonies of sea lion -- where visitors are allowed to snorkle right in their midst -- and 500 species of fish. Work to continue to protect the island is under way by the Nature Conservancy. I'll be getting back to the Baja as soon as I can, since I discover something new every time I visit. Despite much hotter days, the fishing only gets better through the summer months. On this trip we even let the guides know we did not want to catch any more of the large striped marlin, all caught and released, choosing instead to fish for more Dorado, and bringing in nice filets each night to eat fresh at different restaurants. I've written about my Baja trips in the past, but now it looks like the secret of the appeal of La Paz is really starting to get out. Boulder's first-ever food and wine fest, held in Central Park, looks to be a real winner, and a crowd estimated at about 1,000 could easily grow in future years along with the event as word gets out. I just got back this hot Sunday afternoon from the festival, and if your mouth isn't watering a bit after I describe both the food and wines that I sampled, well either I am a poor writer or you just like your Happy Meals. First of all, congratulations to all of the hard organizing work done by both Jackie and Mike Thompson, owners of Boulder Creek Winery and Ulla Merz and John Garlich, owners of BookCliff Vineyards. 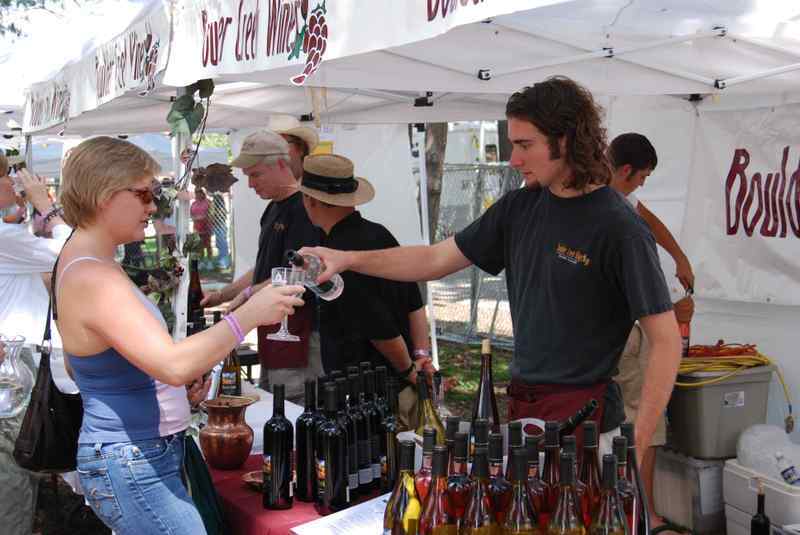 The festival drew 25 wineries, 18 Boulder restaurants and a few other local businesses including Culinary School of the Rockies, Belvedere Belgian Chocolates and Glacier Homemade Ice Cream. it was slow going, Mike Thompson told me, for early registration online, despite a very good Web site and ability to pay via PayPal. But like so many Boulder events, the crowds poured in during the last week, with some 900 people pre-registering for $35. Everyone got five food tickets, allowing you to choose between numerous restaurant offerings, and a $5 certificate off the purchase of any bottle of wine. It was especially fun to sample these Colorado wineries, and purchase a bottle of whatever you liked right there on the spot. Since it was a pretty hot afternoon (where were those clouds anyway? ), I started off with a chilled melon soup from The Kitchen, which I personally rank as one of Boulder's very best restaurants with its menu using all-local, organic ingredients whenever possible. The soup was the perfect cool starter, so it seemed appropriate to sample the Bottom's Up (OK, the label attracted me, too) from Boulder's Augustina's Winery, a blend of Chardonnay and French hybrid grapes. At this point, I knew it was going to be good day. Back to the food area, I chose the Mediterranean couscous in a small phyllo cup alongside fresh mozzarella and sundried tomatoe and basil from John's Restaurant, a longtime Boulder favorite. Noticing a very long line for the new Alba restaurant (formerly Full Moon Grill) in the Village Shopping Center, I jumped in, and turned in a ticket for a taste of braised beef shoulder in a soft polenta. No wonder the line was long, this was delicious. Alba opens in about a week. OK, it was time to shuffle around some of the wine tents, and after the beef, I was ready to move to a red, trying a 2004 Merlot from Boulder Creek Winery. I was still waiting for a cooling cloud to move in, but the tents offered some shade, so I went back to some chilled whites with a Viognier from Snowy Peaks Winery in Estes Park and then a very good 2005 Chardonnay from Plum Creek Winery in Palisade. This was no small feat, by the way, taking notes, getting some photos, carrying my food plate and wine as well as a small wine tote to buy some wines! Moving on. Rmember we're sipping here, and spitting out (occasionally...). A Rose was just right from the Bonacquisiti Wine Company in Denver, followed by a taste of Fume Blanc from Garfield Estates Vineyards in Palisade. For most of the wineries, I usually just tasted one wine, since there were so many to visit. But at Mountain View Winery from Olathe, there were some very tempting and unusual wines including a Cherry Wine, Wild Plum Wine and Pear Rasberry Wine. The winery also offered one of the few pinor noirs at the festival. Hungry yet? Now you're wishing you hadn't stayed inside watching Tiger all day, aren't you? My next food ticket went for some Mediterranean tuna tartar from Jill's Restaurant at the St. Julien Hotel. Time for dessert and my final ticket I chose the banana cheesecake, topped with chocolate, from Seven on Pearl. Not a bad Boulder lunch I have to admit. And dessert calls for a dessert wine, and I didn't want to miss stopping by BookCliff Vineyards tent, where for just a dollar, they were offering a special tasting of three of their reserve wines. Seemed like a fitting close to a mouth-watering afternoon. The tasting included sampling their Reserve Merlot 2005, a Cabernet Franc 2005 and the Adagio 2005, a Black Muscat dessert wine. Both the merlot and cabernet are two you might want to hang onto for few years, they're going to be very good as they age. Boulder's Food & Wine Festival, which benefitted the Humane Society of Boulder Valley, proved to me that indeed that Front Range and Colorado wineries are producing some very good wines. I'm going to look for some of these names the next time I buy, and you should, too. For anyone who hasn't already realized that Boulder's restaurant scene is incredible for a smaller city, come visit soon. The longest line at the festival was for Aji Restaurant, where they were offering samples of their ceviche and other Latin American tastes. Many of the nearby wineries have organized under the umbrella of Front Range Winery Association, and with events like this one, the word will spread. I bought three wines to take home: the Cherry Wine from Mountain View, a 2005 Chardonnay from Plum Creek and the 2006 Old Vine Zinfandel from Bonacquisti. I'll remember the festival with the openings of each of these.